If you've ever wondered how to skin and butcher feral pigs after knocking down one or two on a hunt, it's not difficult and can result in some tasty meat for the dinner table. Feral pigs are a scourge and completely eradicating them is a pipe dream. That's just the truth. While some sounders may be eliminated on tracts, the widespread population of them from Texas throughout the Southeast and elsewhere is just too prolific. Even with all the hunters who kill them each year, it's not enough. They breed like crazy, have few natural predators and can scamper away or hide in thick schmutz that is almost impenetrable. Put a big boar or sow in a Southeast swamp thicket or clutch of Texas cactus and mesquite. Even with great eyes and hearing, we struggle to find them until they bolt away or, sometimes, stand there motionless without making a sound before we finally leave. — If you're hunting in Texas, Oklahoma or anywhere hogs are roaming around cactus, wear leather gloves when you're handling them and dragging them. Their nasty feet will have cactus spines in the skin that can stick in your hands. Ask me how I know. It ain't fun. — When you're gutting them, use your nose. If the guts stink like infection or have some kind of abcess or infection, throw away the animal. It's not worth it. We cut open one in Texas in spring 2018 and it immediately made all of us gag. Dunno what was wrong with it but it wasn't worth fooling with after that. Throw it away and go kill another one or five. — Wash the meat thoroughly to remove debris and hair, just as you would with other meat. Trim away sinew, silver skin or any blood-damaged areas. The meat should look clean and have a good aroma. Put it on ice to chill it and then go about your regular kitchen prep to get it ready for the table. 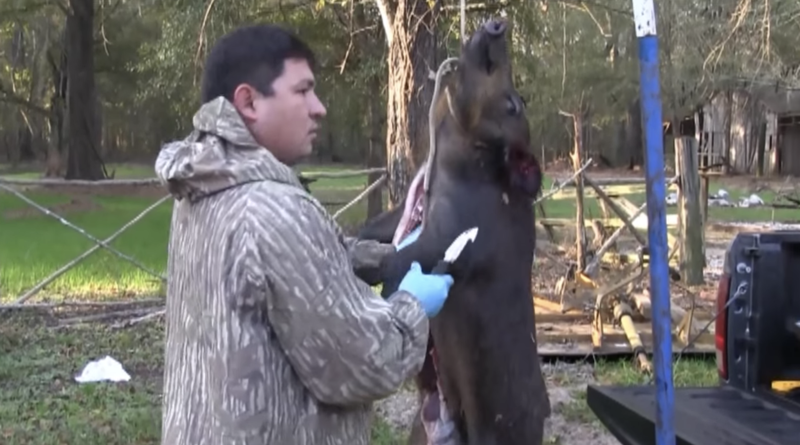 Here's a good video showing how to clean and cut up a feral pig.